Los Angeles native Christian Campos is managing artistic director of the Horizon Music Group. Under Campos’ stewardship, the ensemble has collaborated with the Cincinnati Boychoir (Bach cantatas), Long Beach Camerata Singers (Handel’s Messiah), Pacific Chorale (Lauridsen’s Lux Aeterna), and Bach Collegium San Diego (Bach’s St. John Passion). Campos has performed at the Oregon, Los Angeles, Long Beach, and Whittier College Bach Festivals. His conducting style has been described as “expressive, varied and tuned perfectly with the music” (Long Beach Grunion Gazette). 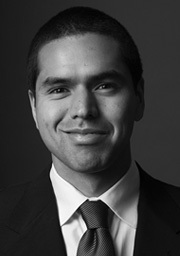 Campos graduated from DePauw University where he studied music and economics while participating in honors programs in business management and information technology. A champion of world music, he received a grant from the ASIANetwork to study Indian Carnatic Music, the result of which was the first ever online database of ragas, composers, and compositions. Since returning to California, he has worked as a guest conductor and contractor of choirs and orchestras, regularly performing with musicians from the Los Angeles Philharmonic, Los Angeles Chamber Orchestra, and Los Angeles Master Chorale. He has contracted for the American Choral Directors Association, Broad Stage, Santa Monica College, CalState Long Beach, Fullerton, Los Angeles, and San Bernardino, and a host of area performing organizations. Christian has been featured on the Los Angeles Philharmonic’s Upbeat Live pre-concert series; in previous seasons he worked as a score reader at the Hollywood Bowl and lecturer as part of the Student Insiders pre-concert series. Campos has served on the faculty at Pomona College and the USC Thornton School of Music, where he recently completed his coursework towards a Doctor of Musical Arts degree.